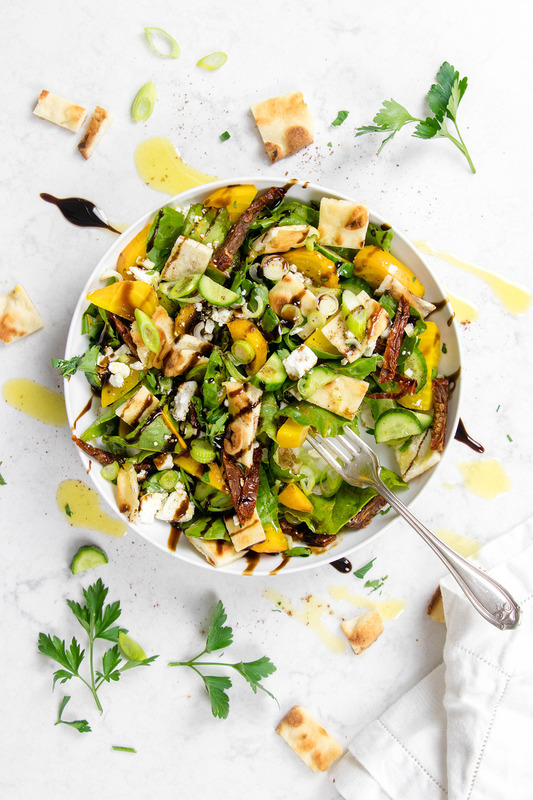 This scallion and beet fetoush salad is a great spring salad, made with fresh ingredients, our balsamic vinegar, and tons of more ingredients to bring it great flavor. Heat oven to 400°F degrees. Remove the stems from the beets as well as the small root. Make sure to reserve the greens. Wrap each beet loosely in aluminum foil. Place them on a baking sheet and roast in the oven until soft, about 30-40 minutes. Remove from the oven and allow to cool. Once cool, peel and chop them. While the beets are cooking, place the flat bread in the oven for 5 mins, or until crispy. Remove the bread chop it into small squares. Set aside. Chop and rinse the beet greens and place them in a large salad bowl. Combine all the other ingredients in the bowl, and sprinkle with a pinch of sumac, salt and pepper. For the dressing, combine the all the ingredients except the glaze. Pour the dressing over the salad. Drizzle with Balsamic Glaze if desired.